Wow, finally back from Texas. Austin, Texas. Seth and I hit some major traffic on the way and the car died about 2 hours away from home on the way back. Just out of the city limits of Palestine. 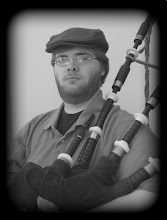 But we’re back now and had a good time at the Austin Solo Bagpipe Competition. I am still leery of my “Dunoon Castle” so went planning on playing “The Siege of Delhi” for 2/4 and planned on playing my “Ewe with the Crooked Horn/Bessie McIntyre” S/R set instead of the “Capt. Colin Campbell/Jock Wilson’s Ball” set I played in Batesville. The jig and 6/8 stayed the same. I was happy with both marches, aside from a couple sticky Ds, but was disappointed with my strathspey/reel. The reel has improved from Tulsa. The strathspey; well, let’s just say I bobbled the football. I lost my focus and went blank on a bar. The drones sounded great though. Great comments from both Ed Neigh and Mike Cusack with a pair of AGLs to boot! Dunbar Poly P-2 drones, Kron ABW chanter with Apps reed (I think), drone reeds are Apps/Naill, bag is the older Ross ex-small zipper without the guts, moose valve.